Another October means another set of Trick or Treat Comics ! 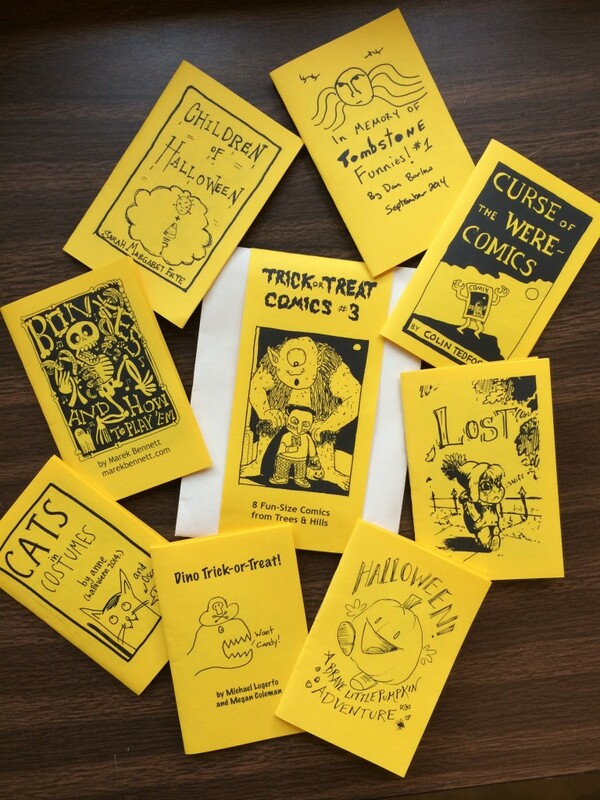 Eight miniature comics perfect for giving to trick-or-treaters, Halloween party-goers, goblins, etc, Trick or Treat Comics #3 features trick-or-treating pumpkins, monster hybrids, bone-playing instructions, were-comics, trick-or-treating dinosaurs, and more! Planning to hand them out for Halloween? You can get all three sets of Trick or Treat Comics for the price of two. The cover of Little Zero #6: Curse of the Were-Comics , part of Trick or Treat Comics #3 . I’m running a free workshop for Trees & Hills‘ third collection of Halloween comics this Saturday in Keene — join in and make some spooky fun! Having trouble finding time to work on your submission for Trick or Treat Comics #3? This is that time! We’ll start off with a brief intro and a brainstorming session for those who don’t have story ideas yet, then settle down to draw. If there is interest in doing so, we may come back after supper to draw some more. We will meet in the semi-spooky ex-food court at the Colony Mill, which is at the opposite end from the bookstore and the smokestack. If you plan to attend please comment, email (organize@treesandhills.org), or RSVP on Facebook so we can have a sense of how many people to expect. It was a cold night with the moon hiding behind clouds. Billy walked down the sidewalk past the cemetery carrying his plastic pumpkin bucket of candy. He wore a black cape & hood and a mask push up on his head. He saw someone slouching near the cemetery gate – a boy his own age, wearing a ghost costume with his head uncovered. “Are – are you okay?” he asked the boy, who didn’t seem very happy. “Well…maybe I could be your friend?” Billy suggested. “Great! C’mon!” the boy headed into the cemetery. “Uh-” Billy said. “Wh-why are we going through the cemetery?” He was looking around so nervously that he didn’t notice how transparent the boy looked now that the moon had come out from behind the clouds. “It’s the shortest way,” the boy said. “Are you sure there isn’t a better way?” Bill asked as the path wound near a crypt. 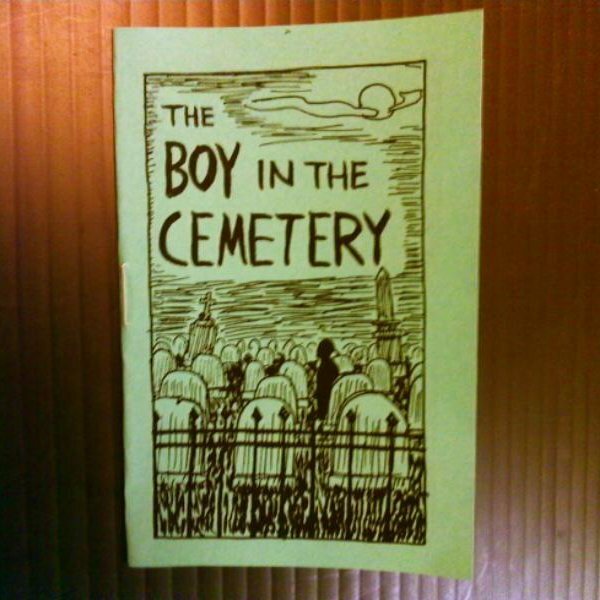 Get copies of “The Boy in the Cemetery” formatted as a minicomic to give to trick-or-treaters, Halloween party-goers, goblins, etc.! 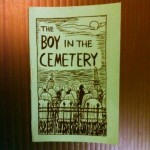 Buy packs of “The Boy in the Cemetery” & my other Halloween comics. 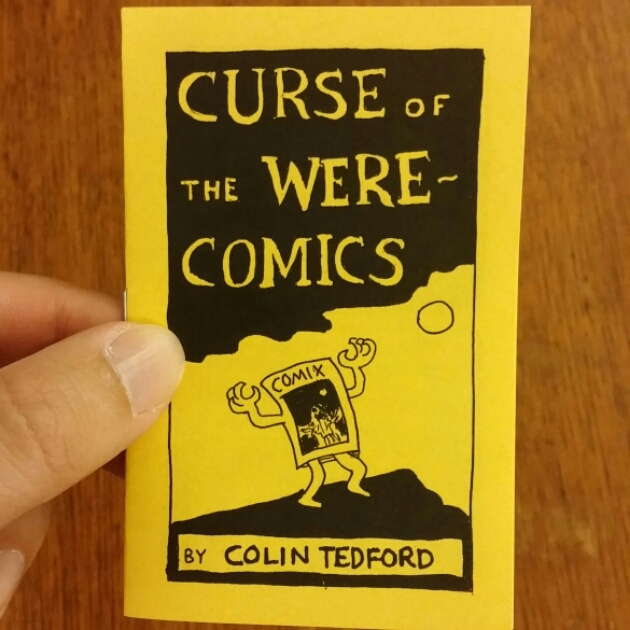 Buy it as part of a set with Halloween comics by other cartoonists. Right-click & download the PDF of “The Boy in the Cemetery” to print. All I ask if you download is that you email or leave a comment to let me know you downloaded it and how many you printed & where they went (for example, “30 copies to trick-or-treaters in Putney, VT”). Assembling the comic is pretty easy! Print the PDF double-sided at 100% (no scaling; don’t let the program “adjust to printer margins” or anything like that). Each copy of the file produces 4 copies of the comic; when you cut them apart, the pages will be in the right order for you to staple & fold. If using scissors instead of a papercutter, you may want to cut after folding. Staple in the center & fold. If you’re using a standard stapler, you may want to fold the comic before stapling or use a ruler to help find the center (at 2 3/4″). If using a long stapler, the measurement marks probably don’t go down to 2 3/4″, so line up a ruler with the one on the stapler to get the added measurement. Check out my other Halloween comics, too!